"You're an exception. The rules don't apply to you." 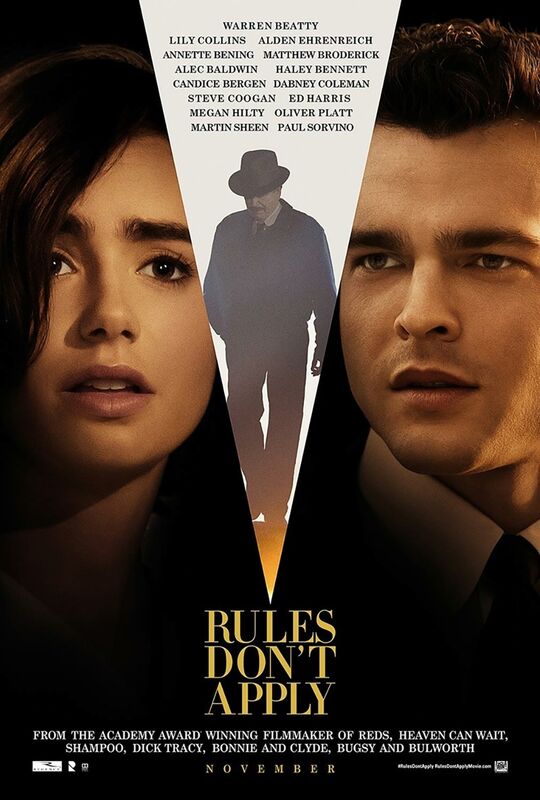 That's a great quote from Alden Ehrenreich in Rules Don't Apply, one of the best comedies of the year. Set in 1958 Los Angeles, Ehrenreich portrays Frank Forbes, a religious conservative driver for Marla Mabrey (played by Lily Collins), a devout Baptist beauty queen from Virginia. After many failed screen tests, & after Marla's mother, Lucy (played by Annette Bening) goes back to Virginia, Frank & Marla fall in love, but since Frank works for Howard Hughes (played by Warren Beatty), he cannot date Marla because anyone who works for Hughes who dates an actress under contract will be fired, & also, Frank has a fiancée, Sarah (played by Taissa Farmiga). However, Frank & Marla frequently see each other in secret. Meanwhile, Hughes has had some financial trouble. He's in debt, he's being told to sell his airline company, & he's said some odd things & forgotten some stuff, & is in danger of being sent to a mental hospital. In order to not be sent to the mental hospital, he must get married. And after an incident with Marla, things begin to unravel for everyone. The ensemble cast is great. Warren Beatty's direction & screenplay is great, marking his first film that he's directed since 1998's Bulworth. The cinematography by Caleb Deschanel is excellent. And the costume design, production design & makeup & hairstyling are all amazing. While it does hit a few bumps in the middle of the film, it is still a great return to form for Warren Beatty.